The world best feeling in life can be showing our doubters by achieving the dream, once they said you couldn’t and proving them wrong. Don’t underestimate yourself just because others find it you are not capable to do it, show them that you can do better than them. Don’t ever let other people’s opinion define you. 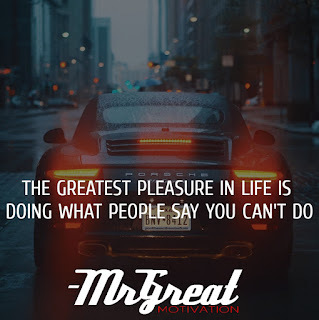 Why let other people’s negative opinions be a roadblock to your success? It’s your dream, your goal, you get to protect it and when you do protect that dream and you’re able to live it, it feels better than having to actually slap someone who doesn’t believe in you right in the face. It’s better than any revenge because you have shown it that they were wrong and you may have even gained a few things in the process. We all have hard days. How we react to those days is very important. We can either learn from it and move forward or let it drag us down. There are countless examples of successful people who would have never made it if they had succumbed to feelings of helplessness. Do not allow fear and anxiety to paralyze your emotions instead of taking action turns all your worry and concern about failure into positive, focused energy. Break down every barrier and create a new benchmark to prove that you're 100% capable and to have the fortune of being able to say "I did it."